Students in the Lenape Regional High School District (LRHSD) now are able to use several 3-D printers, and other technologically advanced systems, in a district-wide Science, Technology, Engineering, and Math (STEM) program, thanks in part to a generous grant from BAE Systems, Inc.
A $7,500 grant from BAE Systems last year provided the necessary funds for the printers, which students in all four schools in the LRHSD — Lenape, Shawnee, Cherokee and Seneca — are using as part of Project Lead The Way (PLTW). 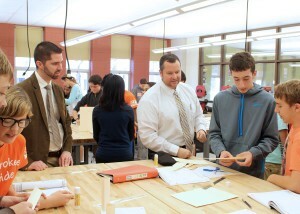 BAE Systems engineers recently toured a Cherokee High School PLTW classroom to see the printers and students in action. BAE Systems is donating another $7,500 to the district for the program again this year; the district has not yet decided how the funds will be used. The Pathway to Engineering program from PLTW is a highly competitive program designed to attract and retain students interested in pursuing a STEM-related post-secondary education and, ultimately, career. Currently, Lenape and Seneca High Schools are in their second full year of the program, and Cherokee and Shawnee High Schools are in the inaugural year. BAE Systems, located in Mt. Laurel, is just one of the community partners that enables LRHSD to offer the program. “BAE Systems is proud to partner with the Lenape Regional High School District to help inspire the next generation and ignite their passion for STEM. We look forward to continuing our partnership in 2016 and beyond,” said Tony Contino, program manager/department manager, AEGIS TECHREP Engineering Support Services, BAE Systems, Inc.
PLTW, a non-profit organization, is the leading provider of STEM education curriculum programs in schools across the United States. PLTW works to prepare students for the global economy, one increasingly focused on high-growth and technology-driven occupations. According to PLTW, by 2018, the nation will have more than 1.2 million unfilled STEM jobs because there will not be enough qualified workers; PLTW advocates STEM learning because the organization believes those fields will provide the most job growth now and in the future. According to Xenakis, the LRHSD STEM course is interdisciplinary in its approach to learning and is offered as an elective independent of any specific department. The curriculum is standards-based and aligned with both Common Core and Next Generation Science Standards.